The district of Vuna supports the Government because they have witnessed developments which they have been crying for for decades. These were the words of Silio Valavakagone of Navakawau while presenting the isevusevu for Prime Minister Voreqe Bainimarama and his entourage during the commissioning of a classroom block for Navakawau Catholic School and their borehole water project. The district’s pledge of support came after Mr Bainimarama had hit out at some Cakaudrove chiefs who had used their traditional influence to politicise developments. 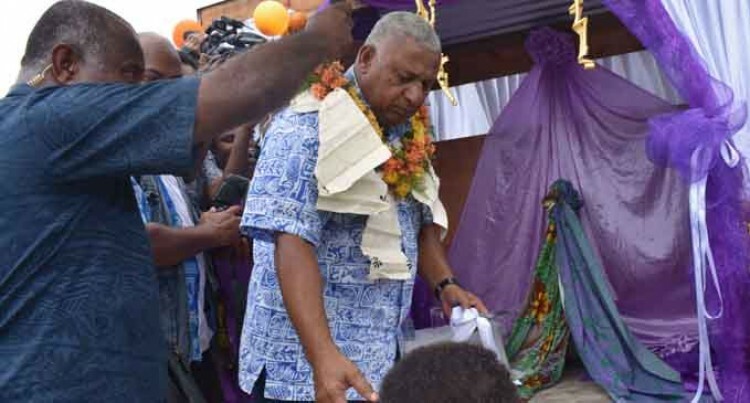 Mr Bainimarama while arriving at the school was accorded a traditional welcome befitting of a chief. He told the PM they have experienced substantive advancement since his Government came to power. He said for years they were calling on past Governments to address issues like water and road, but to no avail. Mr Bainimarama also commissioned the Navakawau $82,000 water borehole project. The Mata-ni-tikina ko Vuna, Laisiasa Tumouta, said this has solved their prolonged water issue. Village headman Sefanaia Ravatu said: “We recently had a well done, but even that could not meet our daily needs. There are about 630 villagers with close to 55 homes standing. The village was one of the badly hit areas in the country during Cyclone Winston.